NATO’s Trident Juncture exercises in Norway will be a test of the bloc’s ability to come to the rescue of a treaty ally at a time of rising geopolitical tensions between Russia and the West. NATO’s credibility as a multinational defense force and a deterrent will be under intense scrutiny. It’s midfall. Norway, a charter member of the North Atlantic Treaty Organization (NATO), is under attack. A foreign adversary’s troops are making an amphibious assault on its coastline near the Arctic. In an emergency session, NATO leaders react to the violation of an ally’s sovereignty by invoking Article 5 of the bloc’s treaty, which calls for collective self-defense. This could be a scenario for Trident Juncture, expected to be NATO’s largest exercise in nearly twenty years. The mock defense of the Nordic state will draw on some fifty thousand military and civilian personnel from thirty-one countries—NATO members plus Finland and Sweden. They will be piloting around ten thousand vehicles, 150 aircraft, and sixty-five ships, including a U.S. aircraft carrier and its strike group. Live exercises are set to commence October 25 and run through November 7. The aggressor in the simulation is fictitious, but the setting and the scale of the exercises point clearly in one direction. Tensions between NATO and Russia, which shares an Arctic border with Norway, are running high. In the last five years, Russia has annexed Crimea, destabilized eastern Ukraine, provided military aid to a brutal regime in Syria, meddled in Western elections, and either walked away from or allegedly violated major multilateral security treaties. “This exercise is part of NATO’s ongoing effort since the 2014 Russian invasion of Ukraine to reassure member states bordering Russia that the Alliance will defend them against Russian aggression,” says CFR’s James M. Goldgeier, an expert on Eurasian security. Despite President Donald J. Trump’s attempts to keep warm relations with Russian President Vladimir Putin, his administration has described Russia, along with China, as a revisionist power [PDF] fundamentally at odds with U.S. values and interests. In May, the U.S. Navy reestablished its Second Fleet to oversee operations in the North Atlantic. The impetus: “We’re back in an era of great power competition,” said Admiral John Richardson, chief of naval operations. Norwegian leaders have said that the potential for war with Russia is low, but they’ve expressed alarm at recent Russian military games that appeared to mimic attacks on its soil. 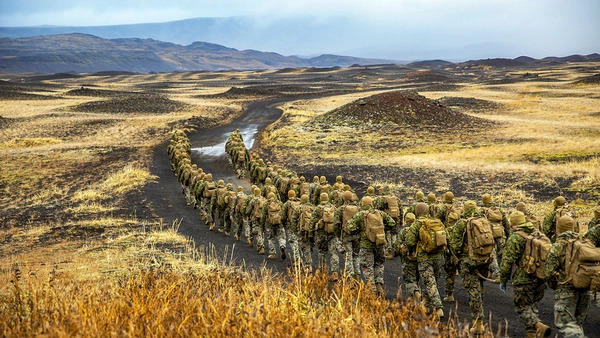 This past summer, Oslo irked Moscow by agreeing to double to seven hundred the contingent of U.S. Marines rotating through Norway for training. NATO conducts dozens of exercises of varying size throughout the year—some on screen, some in the field. Trident Juncture, which will be led by the U.S. Navy, comes just months after the U.S. Army led NATO forces in a major exercise across Estonia, Latvia, Lithuania, and Poland. With Trident Juncture, NATO’s overarching objective is to demonstrate the credibility of its military deterrent and the unity of its membership, despite recent spats between states over budgets, trade, immigration, and other issues. Specifically, commanders are looking to assess several crucial performance benchmarks. Logistics. Will this vast constellation of machinery get everyone where they need to be, when they need to be there? NATO’s several-thousand-strong “spearhead force,” intended to respond quickly in crises, will be closely watched. Interoperability. How well will these troops and civilians from various countries communicate and work together during an intensive war game in what are likely to be freezing wet conditions? Battlefield Norway. 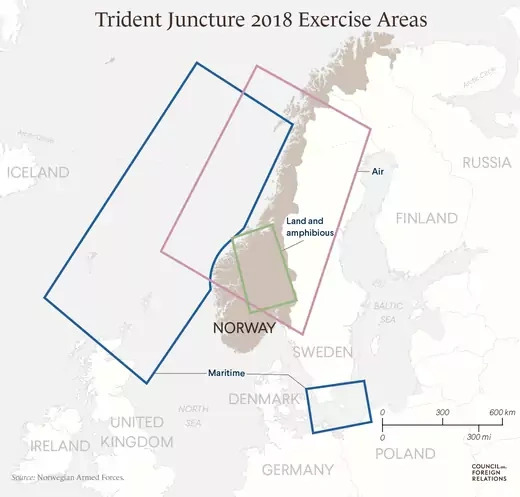 Trident Juncture will be a stress test of how well Norway handles a crush of allied forces. It will be a prime opportunity to evaluate its “total defense” concept [PDF], which aims to coordinate civilian and military resources. Trident Juncture comes just weeks after Russia staged Vostok, its largest military exercise since the Soviet era. In what some considered a message to the United States, several thousand Chinese troops joined the nearly three-hundred-thousand-strong Russian contingent. “For Russia, it’s mostly about signaling to the U.S. that protracted tensions are pushing the Kremlin closer into the orbit of another geopolitical rival,” said Alexander Gabuev, an expert on Russia at the Carnegie Moscow Center.